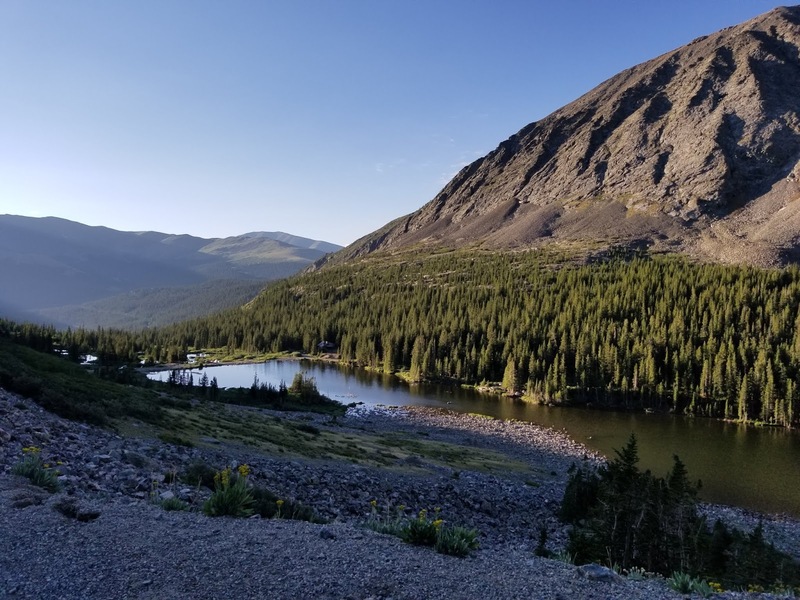 Blue Lakes Dam Elevation: 11,707 ft.
Mt. 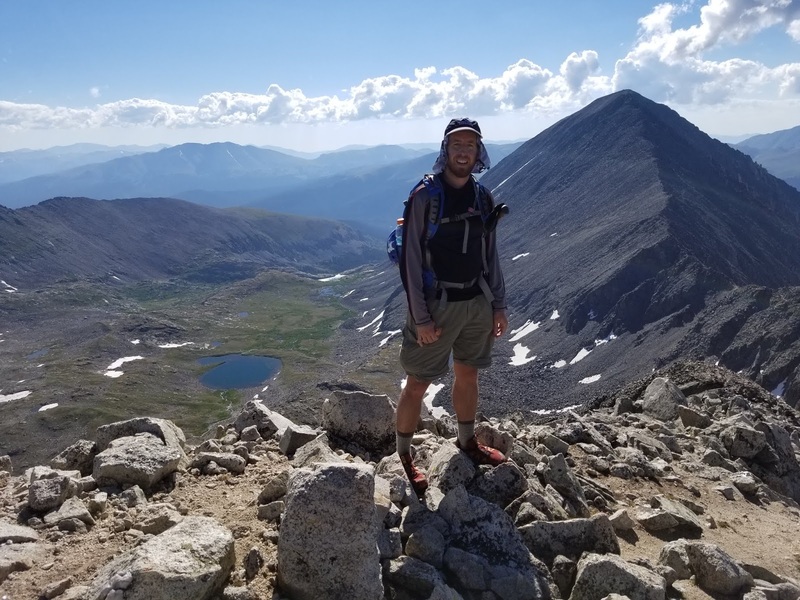 Fletcher Elevation: 13,951 ft. Quandary Peak Elevation: 14,265 ft.
My brother David and I were looking for a thrilling challenge today that would put us on a peak with a good weather forecast. Our original plan was to ascend La Plata Peak by the classic Ellingwood Ridge but the forecast was less than favorable for a challenge that demands perfect weather. 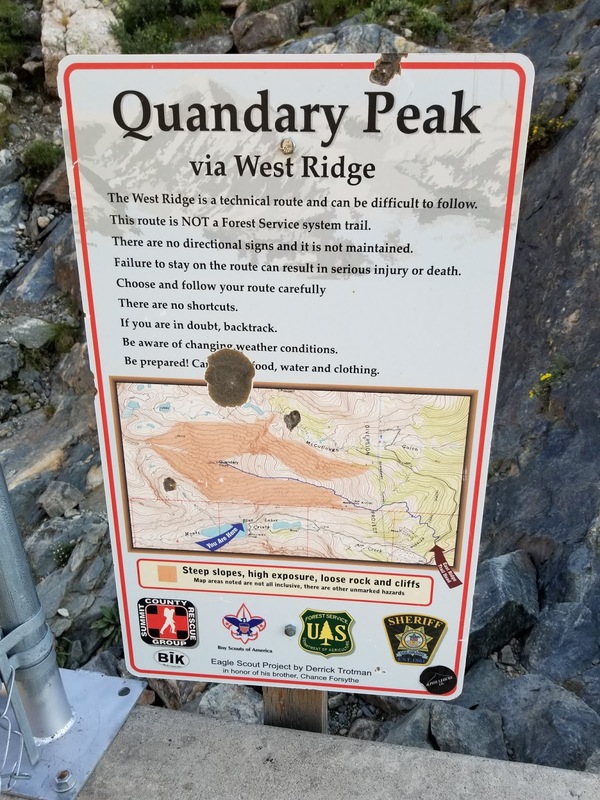 Instead, we decided on the West Ridge of Quandary which had a more favorable forecast and a less-time consuming demand. We wanted to hit the trailhead just after sunrise and made the drive from BV to make the TH just after 6am. We found the lower TH already full of cars, not unexpectedly. We drove up the road just past the initial gate and soon found parking behind a handful of other cars that had parked along the road. 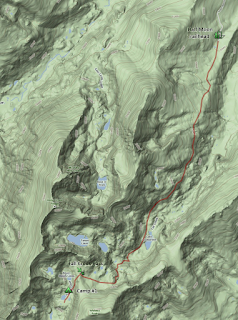 We had debated a number of things with today's West Ridge plan, the first being which route to descend. The East Ridge would be by far easier to descend and well known. The West Ridge a difficult descent but would allow us to complete the route. I loved the elegance of a full mountain traverse and so favored the descent of the East Ridge. This led to the next question of where to park. 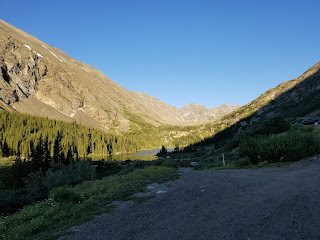 If we drove up to the Blue Lakes Dam parking we'd have to hike the 2-mile road at the end of the day, or park at the McCullough Gulch TH and hike the road to begin the day. We went with the latter. It was a cool 45 degrees at start and the skies with light clouds. We were armed with a really good weather forecast today with only a 20% chance of showers afternoon. We started the hike up the road and soon enjoyed some fine views into the basin below Wheeler Mountain and above the Blue Lake Reservoir. We made the 2-mile walk up the road to the dam in just over 45 minutes. We were passed by a few cars along the way. We weren't going to ask for rides but we figured if any offered we'd take it. Nobody offered. At the dam there were a handful of cars in the parking. We also noted the absolutely beautiful camping that we witnessed around the lake with at least 5 or 6 tents in view. At the parking there was a nice rock ramp leading up to the top of the dam and then into an obvious trail on the north side of the reservoir. 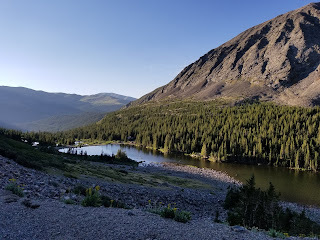 We followed an obvious trail along the reservoir until it basically disappeared and then we ascended through small talus for awhile. Eventually we found a clear trail wondering where it had come from. When we returned home I see on satellite maps I see this trail may have started within a 100 yards of the dam working its way above the trail we started onto. This would be worth looking for. Once on the trail we followed it all the way up into the basin on the southwest side of Quandary. It was quite beautiful in there and the trail in mostly great condition. A few parts had gotten mushy from snow melt but otherwise it worked. 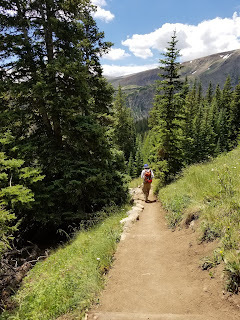 We followed the trail til it mostly ended around 12,500 where the terrain steepened. 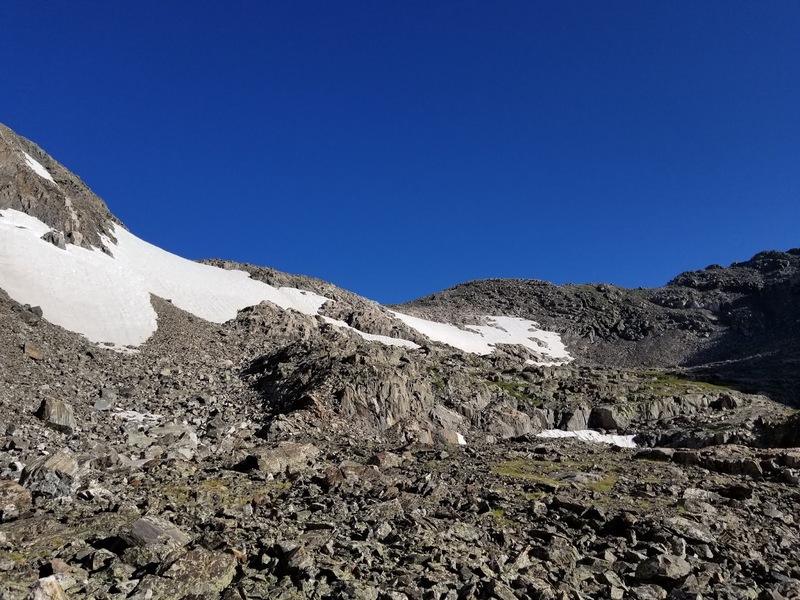 A snowfield around 12,600 was sitting in a gully and forced us to ascend rocks to its south (left) side. We made a very brief class 3 scramble in one spot in here but if so desired this whole section can be kept class 2. 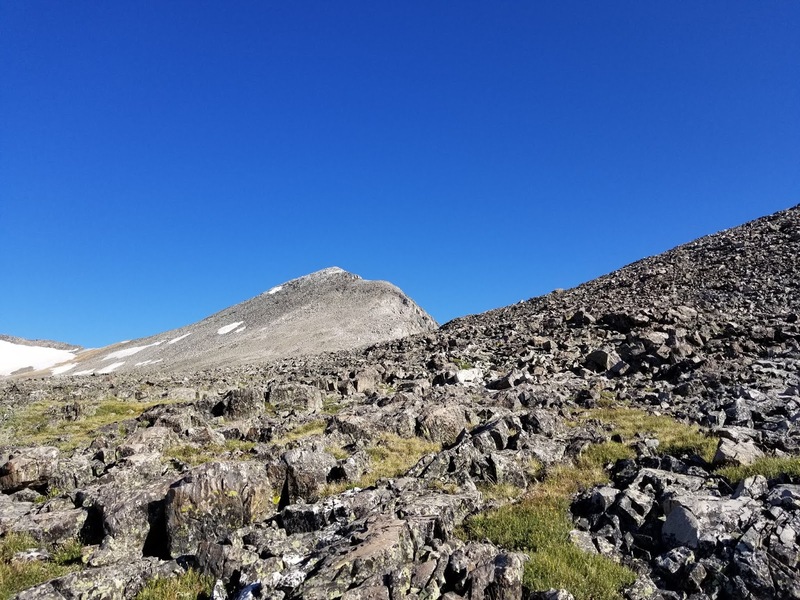 Above that section we followed more level talus fields occasionally seeing a cairn until we reached around 13,000 ft. 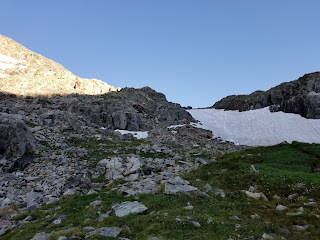 Here there was a rock slope sandwiched on both sides by fairly large snowfields. 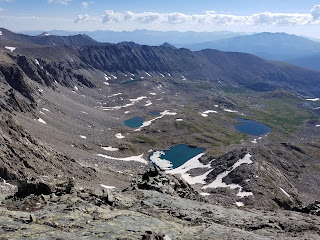 We had seen this from lower in the basin and had hoped the rocks would be easy to ascend. We found they were and the route-finding fairly simple. Around 13,300 the terrain mellowed out wonderfully and here a big idea sat before us. We could see Fletcher Mountain right there with a fairly easy ascent before us and a good weather day. It took very little deliberation for us to decide to give it a go. We continued straight on towards Fletcher's upper slopes. At first the terrain was mixed rock and grassy tundra. As we gained more onto Fletcher itself it transitioned into talus. There really wasn't much of a clear path at this point so we picked our best route working our way upwards through the rock. 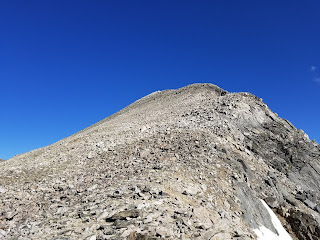 As we neared the summit the slope gradually decreased and eased way for us to stand on the top. Fletcher is really quite a beautiful summit as it gives you beautiful views north into the Tenmile range including neighbors Atlantic, Pacific, and Crystal. To the southeast you have one of the best looks in the world at Quandary's West Ridge. 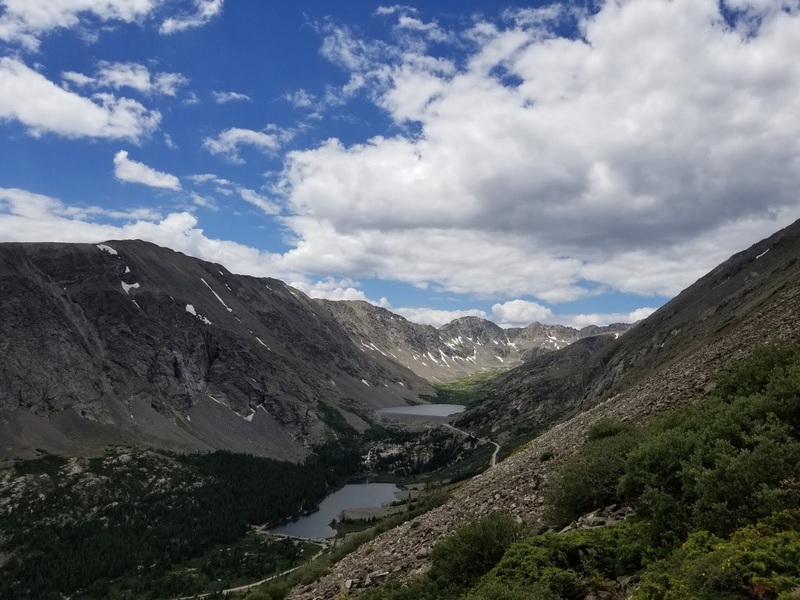 McGullough Gulch and its upper lakes are straight to the east and you have the jagged rimmed basin above Blue Lakes directed to your south. Drift Peak has an obvious and clear ridge leading to the southwest which we saw a group ahead of us attempting. We spent about 15 minutes on the summit and then moved on towards our main objective of the day. The descent from Fletcher involved careful stepping among the talus but it didn't take us long and we were in the flats heading towards Quandary. We know the typical approach to the West Ridge makes a beeline from the ascent route from 13,300 to the ridge. We didn't see it necessary to go out of our way to meet up with that line, so we pretty much stuck to the ridge crest between Fletcher and Quandary as we moved onto the West Ridge proper. At a distance it appears to have difficulties both at the beginning and the ending with more gradual terrain in between. In reality, this proves partly true. 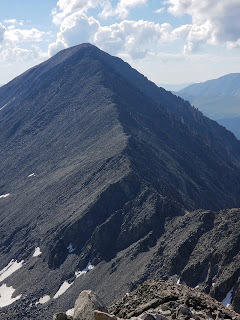 There is a pretty clear but small saddle around 13,350 that I would suggest begins the West ridge proper. Immediately after this begins much more difficult terrain. 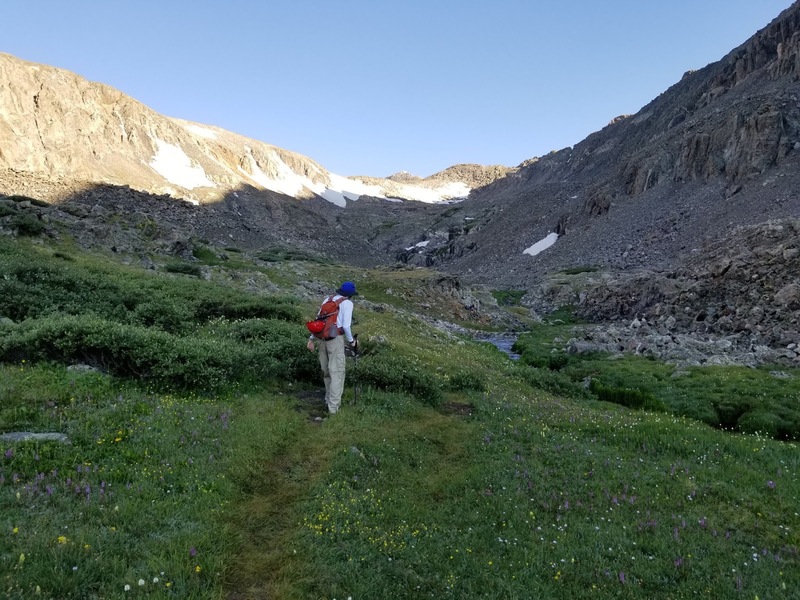 However, an observant eye will see a good trail leading along the south side of the ridge which essentially avoids all of the difficulty. It is class 2 terrain with rock above and decent exposure below. Its not quite a ledge, but a clear enough path amongst the rock on the south side of the ridge. We followed this until it crested out atop the ridge into easier terrain at around 13,500. From that point there is a very reasonable trail that ascends along the crest and gradually moves onto the north side. It is easily sighted at a distance. This ascends until about 13,950 where it makes an abrupt right turn and heads back up to the crest. Here is where the real West Ridge difficulties begin. As we moved eastward on the ridge we began to meander again onto the north side but quickly found cliffy terrain which we didn't like. We ran into a pair of guys who had descended through here as a shortcut but we didn't see the need for it. We backtracked to the crest with a short class 3 climb and made progress to the east. This led us to the very obvious "dirt gulley" which many route descriptions speak of. Here we ran into a group in the midst of the gulley and we saw a moment watching them at work. It appeared the gulley itself was an easy climb but we were curious of their exit. 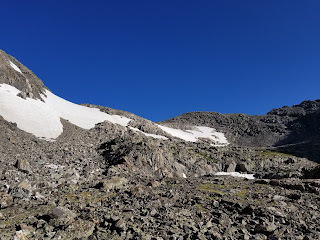 They appeared to exit into exposed rocks in the upper right portion of the gulley some of them stepping out to the exposed edges for a moment. 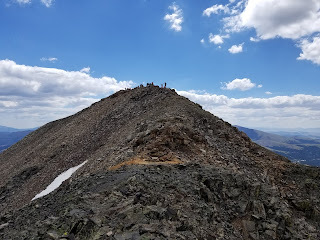 When this group moved on we ascended the dirt gulley and at its top my brother looked at a straight on exit and found a few easy class 3 moves through the rocks at the top of the gully to put us back on the ridge crest. It would seem there is more than one reasonable way to exit atop the gully. Not much later in our scrambling along the ridge we encountered a wall with a vertical crack. It looked bigger than we had been expecting based upon pictures we saw ahead of time. With a pack on it looked difficult to try and stem up through the crack itself. I liked the looks of the rocks to the right which seemed to provide a number of steps and handholds and made a handful of class 3 moves to climb up and around the crack, only setting foot in it at the very top. This proved to be a pretty good line. Above the crack the ridgeline moves onward for but a short distance and then ends abruptly with the crux of the route in view. A class 3 wall blocks further passage towards the summit. 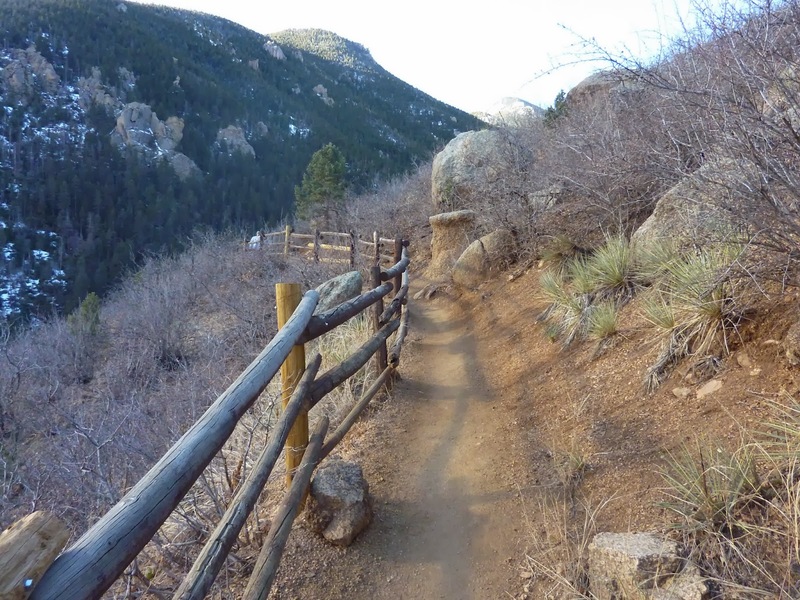 Not only that, but the descent to the saddle at the base of the wall offers no easy path. A straight down descent to the base was likely class 4. To the left were a few exposed ledges which might have offered a route. We opted right into some white rock with a very steep and exposed class 3 descent. I faced in and carefully worked through a series of stretched out hand and foot holds to gain the flat terrain at the wall's base. Up to this moment these were the hardest moves on the whole route. The lower part of the wall has several obvious staircase like ledges that you can use to ascend half way up the middle section of the wall. This leads into the most difficult section. There was a small crack directly in front of me with a rock wedged about 2/3 of the way up it. It would have been some long reaching moves for me to get through it. To my left were some more exposed rocks which provided some good holds but the rocks were in such a position that if they gave way I'd probably be lost. 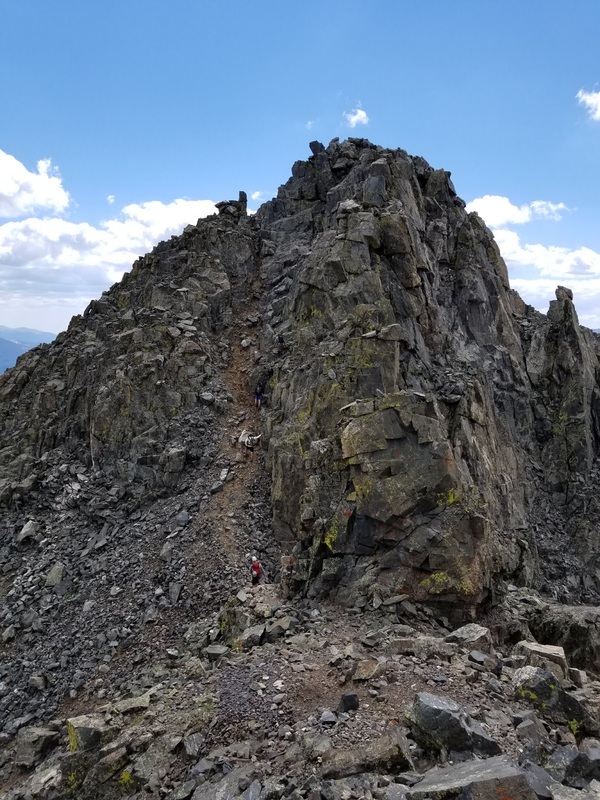 I opted for this route and carefully and quickly climbed up the exposed rocks praying they held firm and allowed me passage. Once I scrambled up this rock I was into safer terrain. I guided my brother through the options and warned of the risk of my route and he opted for the crack. He had some real difficulty in there as well with the long reaches and lacking of a few key handhold places. If that rock in the center gave way he likely also would have been in trouble. He made it up and over and we were in the clear. Above this rock wall there is only easy scrambling and easy terrain to the summit. We could see ahead of us 100 of our new closest friends waiting on the summit. We made our way through the crowds to find a nice spot to drop packs. When we passed the first groups of people we had one gal ask us where we had come from. We briefly explained West Ridge. She seemed to be aware of it. Nonetheless I think we felt a little out of place wearing helmets up to the summit of Quandary. 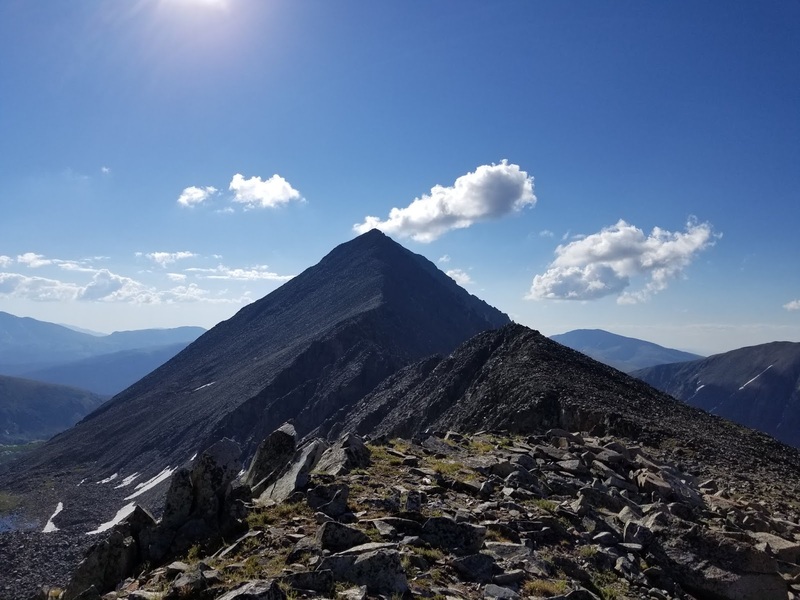 As we contemplated what we had just done, and all of the hikers we were meeting on the summit, many of them looking quite "fresh", we were distinctly aware of the danger that the West Ridge imposes. What I mean by that is, this is not a route to be taken lightly or without preparation. 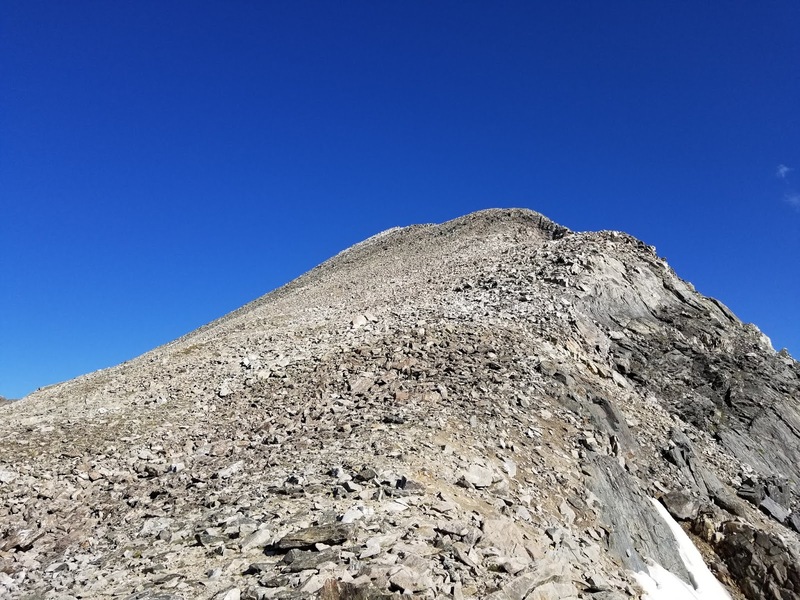 For an unsuspecting, unprepared hiker who had just gained the summit of Quandary from the East Ridge to attempt to go down the West Ridge thinking it would be much of the same, this would be a huge mistake. To route find on the West Ridge blindly (having not seen it before) would be a huge undertaking. There are many steep gullies leading off the ridge that could tempt a hiker into even more dangerous and cliffed terrain. Quite frankly, while we could have descended this ridge, we were glad not to. 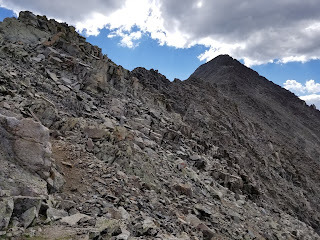 Our plan for the day was to complete the traverse of Quandary and enjoy a much easier stroll down the East Ridge, even if it meant dodging the crowds. 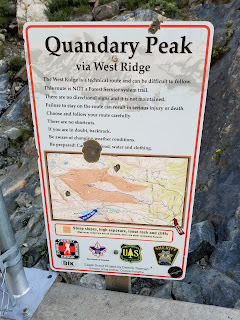 And indeed Quandary was full of the typical Saturday crowd. 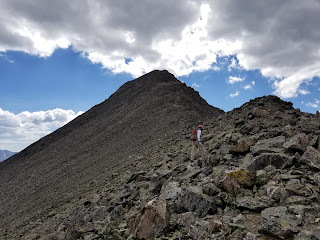 After spending about 20 minutes on top we made a 1:38 descent of the East Ridge without much fanfare. 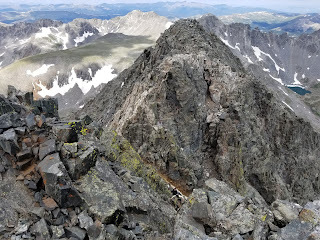 The West Ridge provided some exciting class 3 terrain and in the end we figured we'd be happy to do it again. I don't think I'd want to hang onto the exposed blocks on the class 3 crux wall again, but would be happy to return looking for a better line.